They play without stands  that means all of their music is memorized. Why? Not just for kicks or to show off, but so they can free themselves to act on stage if needed, to wear costumes and maybe a mask, and to communicate directly with us, their audience. 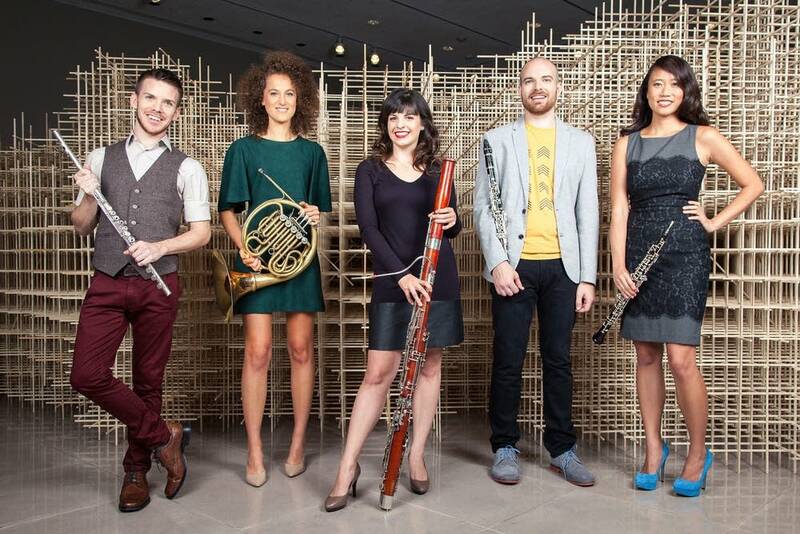 WindSync are a woodwind quintet like you've never heard or seen, and they're made up of a group of virtuosos who are also just generally wonderful people, too. We met earlier this year when they played on-air from the Maud Moon Wayerhaeuser studio at Classical MPR, and I am thrilled they are returning for a five-day residency with the Schubert Club. With a free mini concert, a family concert, a special performance for families with autistic children as well as a Music in the Parks concert, this WindSync residency offers something for everyone! Hailed as "revolutionary chamber musicians," the Houston-based wind quintet WindSync will spend five days in residency with The Schubert Club. Thursday, Nov. 19, 2015  12 p.m.
Plan to arrive early as these concerts often fill to capacity. Friday, Nov. 20, 2015  6:30 p.m. Program: "Oh, the Places You'll Go"
Returning to Music in the Park Series Family Concerts, WindSync take audiences on a musical and emotion-filled journey in this exciting program inspired by the writing of Dr. Seuss. Enjoy WindSync's arrangement of the much-loved Peter and the Wolf by Prokofiev. Learn about the sounds of the instruments, the teamwork of musicians, and your own potential to grow, change, and conquer adversity. Congratulations, today is your day! Saturday, Nov. 21, 2015  11 a.m.
Sunday, Nov. 22, 2015  4 p.m.
Pre-Concert Talk at 3 p.m.
St. Anthony Park United Church of Christ, St. Paul, Minn. PROGRAM: "Something about a Rose: Inspired by Shakespeare"